Inbound tourism has been growing consistently in India backed by a sustained effort by the Tourism Ministry to market India aggressively in key in bound markets. By launching the ‘Incredible India’ campaign, country’s cultured and tourist attractions were promoted in a memorable manner which resulted in an influx of foreign tourists into India. Furthermore, the Ministry has also rolled out a number of factors such as e-visa, visa on arrival facility and better infrastructure have contributed towards the growth of inbound tourism. It is imperative that these efforts continue in order to sustain the growth and continue to attract the foreign visitor who has a number of options to choose from. Looking at historical data we see a good overall growth in the last decade. During the calendar year 2017, over 10 million foreign tourists arrived in India. In addition, even the current government understands the importance of the role tourism can play in the growth of the nation. Sources point that tourism in India accounts for 9.6 per cent of the GDP and is the third largest foreign exchange Government of India has set a target of 20 million foreign tourist arrivals (FTAs) by the year 2020. Ashish Dhruva, Vice President – Marketing, Cleartrip tells, “The launch of initiatives like ‘Incredible India!’ and work on removing infrastructure roadblocks like introducing a fresh category of medical visa, all point in the direction that we can expect a big growth in inbound tourism in the times to come. The focus needs to be at a comprehensive and optimal infrastructure development. While India has a lot to offer to tourists, the competition in this space is fierce, which is why the finer details need to be looked into. A sensitive service industry, like tourism, equally depends upon the efficient work of various tour functionaries such as tour guides; a careful programme of training to facilitate effective communication can go a long way. Similarly, data connectivity in remote areas, hygiene, safety provisions, road and rail connectivity, etc, all need to be taken into account and optimised. Tourism is a labour­ intensive sector, which requires labour laws to be made simpler with a thrust on empowering the man power”. Competitive tax rates at par with global norms are a much­ awaited push that this sector has GST on luxury accommodation should be reconsidered keeping in mind the importance of inbound tourism and the negative impact it has, in making India a less lucrative option for travellers. The government can look at incentivising private sector involvement in tourism infrastructure development to accelerate growth. According to Ashish, while there are several places that are yet to get their due place on the tourist map of India, he wants to highlight – Mohenjodaro, the site of great historical significance, where an important chapter of a major civilisation was written. The place needs to be made more accessible and better known. Sudhir Patil, Director, Veena World speaks, “We expect tremendous growth in inbound market of India due to flexible visa policies issued by the government. However, an effective promotional international campaign, as part of the government’s initiative to promote tourism will help attract tourists to India. At the same time, we expect some consideration over GST rates to 4 and 5 star hotels. Also, we need to have proper local licensed guides in different foreign languages in order to cater to more and more inbound tourists. This should be promoted on a war footing to create job opportunities for youngsters as well as those who retire at an early stage. We believe there is a great potential to promote states such as Maharashtra, Kamataka, Gujarat and Madhya Pradesh. We need to have better air connectivity and pro-active measures from the respective state tourism boards that campaign overseas along with the private parties”. Union Tourism Minister Alphons Kannanthanam had mentioned that India earned an income of US $27 billion from Foreign Tourist Arrivals in the year 2017. By 2025, FTAs in India is expected to reach 15.3 million, according to the World Tourism Organisation. These figures indicate that inbound tourism in India is growing and has a great potential. However, the country needs to work further on the flexible government policies and develop rail and road infrastructure. Karan Anand, Head, Relationships, Cox and Kings also shares, “The state governments have to work together to create a seamless and uniform ecosystem that allows tourists to experience India with ease. Packaged train travel, easy bus connections and safe car hire services combined with great freeways and highways are critical for an unmatched tourist experience. Also, we need to create a pool of trained manpower in hospitality and tourism sector in order to serve the international tourists in a better way. The tourist circuits identified by the government include all major tourist hotspots including the upcoming inbound travel destinations such as Leh-Ladakh Q&K), Hampi (Karnataka), Manali, Spiti (HP), Dudhwa (MP), Kohima (Nagaland), Sikkim and Andaman Islands. However, creating unforgettable experiences for inbound travellers is essential rather than merely banking on the natural beauty of a place. 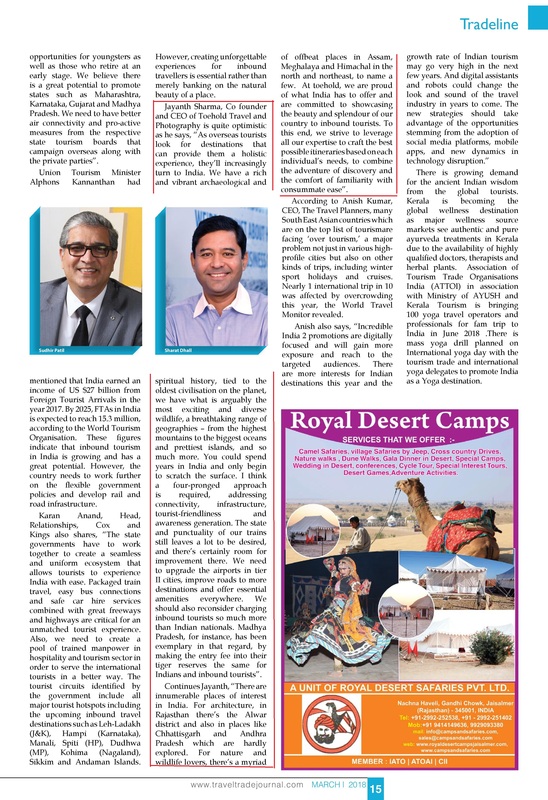 Jayanth Sharma, Co founder and CEO of Toehold Travel and Photography is quite optimistic as he says, “As overseas tourists look for destinations that can provide them a holistic experience, they’ll increasingly tum to India. We have a rich and vibrant archaeological and spiritual history, tied to the oldest civilisation on the planet, we have what is arguably the most exciting and diverse wildlife, a breathtaking range of geographies – from the highest mountains to the biggest oceansand prettiest islands, and so much more. You could spend years in India and only begin to scratch the surface. I think a four-pronged approach is required, addressing connectivity, infrastructure, tourist-friendliness and awareness generation. The state and punctuality of our trains still leaves a lot to be desired, and there’s certainly room for improvement there. We need to upgrade the airports in tier II cities, improve roads to more destinations and offer essential amenities everywhere. We should also reconsider charging inbound tourists so much more than Indian nationals. Madhya Pradesh, for instance, has been exemplary in that regard, by making the entry fee into their tiger reserves the same for Indians and inbound tourists. Continues Jayanth, “There are innumerable places of interest in India. For architecture, in Rajasthan there’s the Alwar district and also in places like Chhattisgarh and Andhra Pradesh which are hardly explored. For nature and wildlife lovers there’s a myriad of offbeat places in Assam, Meghalaya and Himachal in the north and northeast, to name a few. At toehold, we are proud of what India has to offer and are committed to showcasing the beauty and splendour of our country to inbound tourists. To this end, we strive to leverage all our expertise to craft the best possible itineraries based on each individual’s needs, to combine the adventure of discovery and the comfort of familiarity with consummate ease”. According to Anish Kumar, CEO, The Travel Planners, many SouthEast Asian countries which are on the top list of tourism are facing ‘over tourism,’ a major problem not just in various high­ profile cities but also on other kinds of trips, including winter sport holidays and cruises. Nearly 1international trip in 10 was affected by overcrowding this year, the World Travel Monitor revealed. There is growing demand for the ancient Indian wisdom from the global tourists. Kerala is becoming the global wellness destination as major wellness source markets see authentic and pure ayurveda treatments in Kerala due to the availability of highly qualified doctors, therapists and herbal plants. Association of Tourism Trade Organisations India (ATTOI) in association with Ministry of AYUSH and Kerala Tourism is bringing 100 yoga travel operators and professionals for fam trip to India in June 2018 .There is mass yoga drill planned on International yoga day with the tourism trade and international yoga delegates to promote India as a Yoga destination.